Amanda Griesser is the new Communications Associate for Calvary Women’s Services. 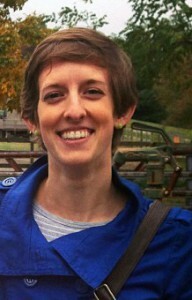 She started last month and has already been busy writing, editing and tweeting all about Calvary’s work and programs. Get to know Amanda and please welcome her as one of the newest members of Calvary’s staff! Share a little about yourself! I have lived in the D.C. area for almost two years after living in Pennsylvania, Ohio and Alabama. I interned in D.C. and Alexandria for two summers while I was in college and could not shake my desire to come back to the area. While in college I majored in English with a concentration in creative writing. I love writing and I’m lucky that I get to do it every day as part of my job. What is it about Calvary that made you pursue a career here? Calvary’s mission really stood out to me. I wanted to make a career move to a place that is making a tangible difference. I didn’t know about Calvary or its reputation before I started working here, but after just a few days I could see how meaningful this place is for the women in the community. Applying for the job was a great decision. Is there something that you are particularly excited to work on at Calvary? Being in a communications position means I need to keep up with a rapidly changing environment – there are so many tools out there to help us communicate! I’m just excited to try out new ideas that can help convey all the great work that is happening here. I’m also excited to interact with women, learn more about them and share their stories. I love classical music and if I could spend every weekend listening to a live symphony, I would! I also love going to the movies, reading and spending time at the beach when I can.